My initial response would be coffee, lots of coffee. Actually, to be honest, I have always been a Type-A personality. For those of you unfamiliar with personality types, a Type-A person is someone who is ambitious, organized, sensitive, proactive, and concerned with time management. Often, these people are often characterized at workaholics. Yes, that’s me… But getting back to the management of multiple social media accounts. I began using Hootsuite when I started a business in 2012. Then I was managing only 4 accounts – my own business’ accounts: Facebook Page, Twitter, LinkedIn Company Page, and the now defunct Google+. As the business evolved, so did my client list. I develop simple content strategies with my clients that outline the look and feel of all the content posted to a social media channel. This includes: photo or video type/quality, short/long description, voice, personality, researched hashtags, link, emojis, as well as frequency and timing. The goal of the document to ensure that there is no question about how something is to be posted or shared on social media. Next, I develop calendars – physical paper calendars outlining when content will be released based on a business’ sales and business development strategies. Now, before you get on my case about paper calendars not being efficient or telling me “there’s an app for that” – I know how my brain functions and organizes information. I need to see it in a physical paper calendar, one that I can write on and cross off tasks. You’ll be happy to learn that these calendars are created using Word or Excel and are shared via Google Drive or Dropbox with the respective client. Once my client and I have figured out style and what we’re going to say, I open up one of my favorite programs, Canva.com, to develop all the social collateral. Once I have developed the content (approved, of course), I use this as a template or guideline to create in bulk all subsequent collateral for the function, be it official or silly holidays, in-store campaigns, quote of the days, or contests. The bottleneck is really developing an image that will withstand the test of time as well and remain brand consistent. I work with many businesses who operate within highly regulated industries – such as government, insurance, and real estate. There are more rules about what you can’t do than what you can. I have to ensure that all content is approved well in advance of its release. Then I take all the collateral and match it alongside the content calendar, and schedule into Hootsuite. In many cases, a client’s content is scheduled at least 3 months, or up to 6 months in advance. There are instances, however, where the content needs to be shifted based on local or international events. If that is the case, I simply remove or reschedule the content. This is all contingent on the event, the client’s requests, or my professional judgment of the situation and the potential, if any, backlash. Since all the content is scheduled in advance, it frees up my time to monitor and manage accounts on a day-to-day basis. This is completed using unique streams within Hootsuite including, content-based geotags, mentions, hashtags, lists, as well as keeping an eye on the competition! 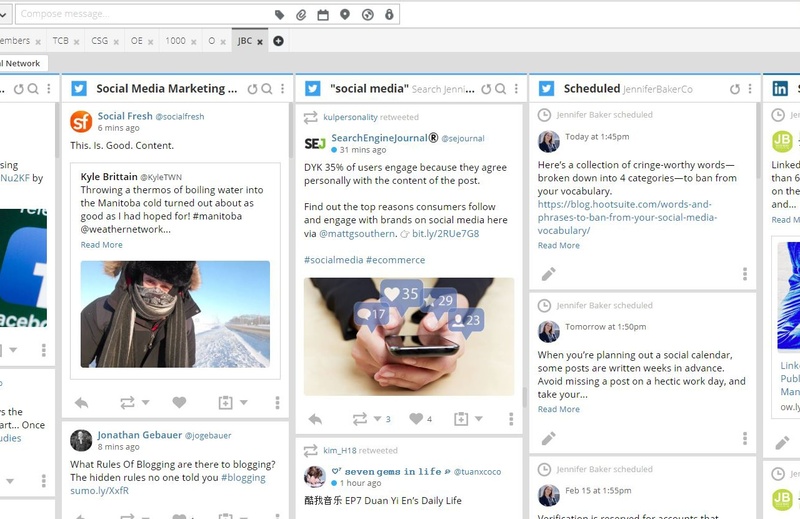 With Hootsuite’s Tabs and Streams, it keeps all client accounts separate while ensuring that I am efficient with my time management. Simply stated, my strategy is: plan, implement, monitor, and analyze (PIMA)! Oh, and in my free time, I am working on a Masters in Education, while raising a two year old!